(PhysOrg.com) -- Astronomers using NASA's Hubble Space Telescope have ruled out an alternate theory on the nature of dark energy after recalculating the expansion rate of the universe to unprecedented accuracy. Every decrease in uncertainty of the universe's expansion rate helps solidify our understanding of its cosmic ingredients. Knowing the precise value of the universe's expansion rate further restricts the range of dark energy's strength and helps astronomers tighten up their estimates of other cosmic properties, including the universe's shape and its roster of neutrinos, or ghostly particles, that filled the early universe. "We are using the new camera on Hubble like a policeman's radar gun to catch the universe speeding," Riess said. "It looks more like it's dark energy that's pressing on the gas pedal." Dark energy is one of the greatest cosmological mysteries in modern physics. Even Albert Einstein conceived of a repulsive force, called the cosmological constant, which would counter gravity and keep the universe stable. He abandoned the idea when astronomer Edwin Hubble discovered in 1929 that the universe is expanding. Observational evidence for dark energy didn't come along until 1998, when two teams of researchers (one led by Riess) discovered it. "The hardest part of the bubble theory to accept was that it required us to live very near the center of such an empty region of space," explained Lucas Macri, of Texas A&M University in College Station, a key collaborator of Riess. "This has about a one in a million chance of occurring. But since we know that something weird is making the universe accelerate, it's better to let the data be our guide." Using stars as "cosmic yardsticks" measuring the universe's expansion rate is a tricky business. Riess' team first had to determine accurate distances to galaxies near and far from Earth. 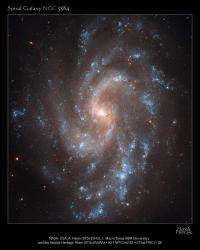 The team compared those distances with the speed at which the galaxies are apparently receding because of the expansion of space. They used those two values to calculate the Hubble constant, the number that relates the speed at which a galaxy appears to recede to its distance from the Milky Way. Because astronomers cannot physically measure the distances to galaxies, researchers had to find stars or other objects that serve as reliable cosmic yardsticks. These are objects with an intrinsic brightness, brightness that hasn't been dimmed by distance, an atmosphere, or stellar dust, that is known. Their distances, therefore, can be inferred by comparing their true brightness with their apparent brightness as seen from Earth. Among the most reliable of these cosmic yardsticks for relatively shorter distances are Cepheid variables, pulsating stars that dim and fade at rates that correspond to their intrinsic luminosity. But Cepheids are too dim to be found in very distant galaxies. To calculate longer distances, Riess' team chose a special class of exploding stars called Type Ia supernovae. These stellar explosions all flare with similar luminosity and are brilliant enough to be seen far across the universe. By comparing the apparent brightness of Type la supernovae and pulsating Cepheid stars, the astronomers could measure accurately their intrinsic brightness and therefore calculate distances to Type Ia supernovae in far-flung galaxies. Using one instrument to measure the Hubble constant is like measuring a hallway with a tape measure instead of by laying a ruler from end to end. By avoiding the need to pick up the ruler and lay it back down, you can prevent mistakes. 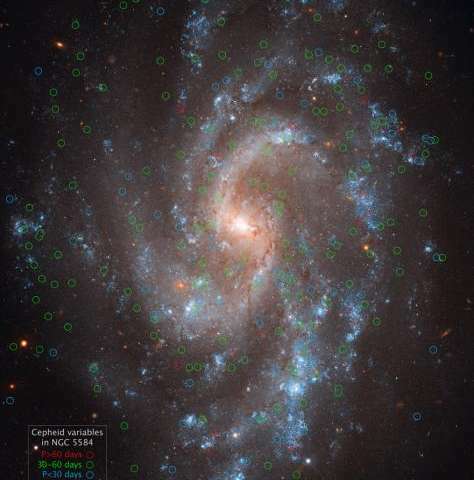 "The camera on Hubble, WFC3, is the best ever flown on Hubble for making these measurements, improving the precision of prior measurements in a small fraction of the time it previously took," Riess said. The astronomer hopes that Hubble will continue to be used in this way to reduce the uncertainty in the Hubble constant even more, and thus refine the measured properties of dark energy. He suggests the present uncertainty could be cut in two before Hubble gives way to improvements out of Hubble's reach but within the scope of the James Webb Space Telescope, an infrared observatory scheduled to launch later this decade. Excuse my ignorance, but instead of DE pushing inside this verse, couldn't empty space outside this verse be 'pulling' the universe from all directions, from the outside, like negative pressure in normal situations? Sigh. Again, I still don't understand what empty space actually 'is'. Did inter-galactic space get 'made' in the BB? Is there a difference between inter-galactic space, and 'space' outside the universe? There is no such thing as empty space. At least not within our universe. What you perceive as nothing is actually everything in harmony. Matter is just, in layman's terms, the separation (or disharmony) of vacuum. If you'd use a microscope capable of observing infinitesimal objects you'd observe what would seemingly be intense chaos in vacuum. What is it pulling? I don't think this turn of phrase is helpful because of the lack of definition as to what "empty space" would be or what "outside the universe" would mean. Our observations of other galaxies are red shifted suggesting they are accelerating away from us / each other. Dark Energy or a repulsive force is the prevailing theory to explain this. Another thought was that this red shift was a result of relativistic effects of Earth being near the center of a "void bubble" in the universe, but this research shows that ain't so. Score for the Copernican principle! Earth is still just an insignificant Pale Blue Dot. Hmmmm. The only problem is the many orders of magnitude that quantum calculations give for the vacuum energy suggests that maybe this interpretation of the vacuum is incorrect. We don't know what dark energy is, just like dark matter. Dark means we don't know. We see the effects of something and can make some predictions, but we still search for an explanation. Sigh. (1)Again, I still don't understand what empty space actually 'is'. (2)Did inter-galactic space get 'made' in the BB? Is there a difference between inter-galactic space, and 'space' outside the universe? Good questions. I second them. Here is a stab from clueless me. (1)If empty space = vacuum, I don't think we know yet what it is, hence Dark Energy. If empty space is something else??? (2)Space-time "started" with the BB. Before the BB just "wasn't". There is no space outside the universe. Are there other universes? Maybe, but my understanding is that you couldn't travel to them by "conventional" means. i.e. you can't fly out of our universe, through some void, to another one. The space-time we exist in is our universe, there is no "outside". Consider yourself torn... sounds like you have a good grasp. Dark matter and dark energy were silly hypotesis invented (ad hoc) to explain our lack of understanding on very fuzzy measurements. The point is the river measurement was wrong and we don't need to redefine anything. I am happy that HST is now fini tuning its measurements to allow to get rid of this clumsy dark "stuff"! Brian Greene was recently talking about other universes outside of our universe that could help support your idea. Brian has a new book titled "The Hidden Reality" published 2011. A theory called the "Dark Flow" is another way something could be pulling from the outside. For "Dark" Matter, read "Unknown" Matter. Similarly for "Dark" Energy. We call them dark because we can't directly observe them. We see their effects and surmise their existence. Question: "Is the entire universe and everything in it expanding?" If so, "Is local space also expanding, down to the subatomic level?" It's mind-boggling to me that the particles within my body may also be spreading apart at the same rate as the entire universe. Too small to measure perhaps, but I'm part of the inflationary process. I still cannot understand why we would not expect the expansion of the universe to be every increasing in velocity. It follows like night follows day that if space is expanding at a constant rate therefore universe will expand at accelerating rate. That will happen simply because as space expands there is more of to expand. Of course we are by no means certain that space is in fact expanding but if it is then it would have to accelerate. Question: "Is the entire universe and everything in it expanding?" If so, "Is local space also expanding, down to the subatomic level? There is no void that is causing the universe to expand. Our universe is full of stuff called dark energy. As the universe grows more dark energy is created. For example, our bodies do not consist of voids (empty space), so dark energy is only formed in the void(s). I think the integrity of the Space time continuum, is a function of the displacement/time/gravity component values within a specified region; therefore where the gravity component is reducing more significantly within a region i.e. inbetween Galaxies or galaxy clusters the space is undergoing asymptotic negative collapse which bestows itself as increasing expansion of the space time component towards zero potential energy field, this explains the condensation pattern the universal map has revealed recently. I've always wondered about gravity since no-one seems to really have any good explanations on what it is and how it works. Is it possible that dark energy or matter or whatever you wanna call it is directly related to it in the sense that its static in the universe, and gravity is simply the result of the mass of an object in space pushing up against it? I'm not a physics expert or anything just a random thought that popped into my head. I've tried to wrap my head around the idea that it's a "dimple" in the fabric of space-time, but trying to illustrate that example only makes sense to me if you were to draw it on 2 axises, not 4. Especially in the case of black holes. The way black holes are illustrated is that its a huge hole in the fabric of space-time, but why would that hole only go in one direction? And why do the black holes have an event horizon on a 2D plane in the form of a circle instead of a 3D sphere? Since every location in the universe is a point in space, I don't understand how the expansion rate of the universe can be any different than the expansion rate of space. but why would that hole only go in one direction? And why do the black holes have an event horizon on a 2D plane in the form of a circle instead of a 3D sphere? Because gravity is only attractive (nothing with negative energy density has ever been observed). What you are probably referring to is called an embedding diagram. The time and one of the space dimensions is excluded from such diagrams, and the resulting 2D surface is displayed as 2D surface curved in 3D. So, spheres are reduced to circles. Note that an additional dimension is not required (nor thought to exist) for space-time to be curved, though it does help with visualization. - there is no such thing as "empty space"
I wasn't referring to dark energy or dark matter. I was referring to such things as virtual particles that constantly pop in and out of existence. Particles and antiparticles that appear out of vacuum. You don't need dark energy or dark matter to show that vacuum isn't "empty". All you need is a vacuum chamber and two metal plates to demonstrate the casimir effect. you don't need virtual particles or casimir effects to show that "empty space" is just words slapped together that have no meaning. its the old zen demonstration of the game of black vs white. you cannot have one without the other. no up without down, no left without right. no space without matter. "Is the entire universe and everything in it expanding?" If so, "Is local space also expanding, down to the subatomic level?" Spacetime isn't expanding at every point, certainly not at the subatomic level. It doesn't occur at local scales, and by local, I mean within galaxies and galaxy clusters. At these scales, gravity plays a dominant role, keeping everything in place. It's only at much larger scales that the effects of expansion become evident. East west effective Interaction helps in Time. Sorry if this is a really daft question but is it possible that dark matter is just matter that cannot be seen because no light is coming from it i.e Rocks, planets, dust etc that is either obscured behind stars or simply does not have any light reflecting off it in our direction? No, it's not possible. Even if there was the same amount of normal, but hidden, matter out there (there isn't), it would still be way too small an amount to account for observations. And it's not just the quantity of matter, but its distribution and interaction with normal matter which points to dark matter being of non-baryonic type. If not, how is all this matter measured and accounted for? Through gravitational effects on normal (luminous) matter, including gravitational lensing effects and computer modelling of the early universe. I'm very familiar with the current theoretical concepts on this topic. I've read a couple Feynman books, all of the Hawking books, and seen all the astrophysical shows on TV. I'm not too modest to say the latest Hawking book wasn't over my head. There was only ~2% I didn't completely understand. I don't recall anything about what space is, if anything. I get the virtual particle thing, DM, and DE. I'm not talking about any of that. They say space was created in the BB. Then what is it? Why couldn't you hypothetically travel to the edge of this verse and beyond? I'm proposing a thought experiment here, not saying we could accomplish this. I get the logistical problems of travel that far, and that there might not be an 'edge' or 'end' of this verse. If there is no difference between inter-verse (or outer-verse, if this is the only universe) space and inter-galactic space, then why can't our verse merely be 'flowing' into the void, in all directions, creating a redshift? "I'm not getting fat, I'm just redshifting!" These also are good questions. Our brains evolved in the course of dealing with things on the scale of our workaday world. The further we get from our normal scale of things the more we can be misled by our preconceptions. I found that article very helpful, in so far as I understood it; but I am not a mathematician and not the foggiest idea what "Lie groups" are. If there are many different existences, as I conceive them, and each only has an interface with some but not all of the others, such that we could represent these boundaries as the overlapping areas in Venn diagrams, this could be a very feasible way of accounting for the existence and evolution of space time and its particle and wavecals. Wow! Almost no cranks! Why can't all discussions be this clean? @bluehigh: Didn't I say there wasn't anything as "empty space" in my first post? I admit I confused things by then equating it to the vacuum, but that was more of a deflection to indicate that the vacuum is as empty as we get and if that isn't your empty space then "???" @Skultch: In our space-time (universe), there is no limit to travel beyond ,I think answers your question. My understanding is that you can't get beyond our universe in any x, y, or z direction. Before the BB Space-time just wasn't. When you get the into the theory of branes and such interacting, then we get into an area I don't fully grasp with respect to whether "travel" between them is possible. Maybe the universe is in a giant Higgs bubble and you can move to different bubbles with varying strength Higgs fields, but that is just speculative babble. I'm not sure whether the silence of the cranks bodes good times for the DE concept. Thank God the void theory has been debunked. Skultch had an interesting thought provoking idea. What do you think is better than DE? I know DE is correct, but have to wait for various reasons. I cannot wait to see what you have unless it is copyright protected and you are waiting to write a book which I would not blame you for holding back for that reason. When you get the into the theory of branes and such interacting, then we get into an area I don't fully grasp with respect to whether "travel" between them is possible. Maybe the universe is in a giant Higgs bubble and you can move to different bubbles with varying strength Higgs fields, but that is just speculative babble. Doesn't M-Theory suggest that the ends of strings conveying the electromagnetic force have to be bound at the ends to branes? I am doing my best to remember what I read while at work, but I think the Theory forbids interaction between branes by means outside of gravitation. I don't think you could travel between them. Hopefully, someone will come along and add to my fragmentary knowledge on this topic. That's right. According to M-theory only gravitons may travel between p-branes. There is however research based on M-theory that suggests other particles may as well behave as such, but these are mere extensions of the M-theory rather than the theory itself. Not really. It's just that trying to understand the "ultimate" nature of existence is intrinsically paradoxical; one has to stop somewhere, at least for a given moment. I tend towards a kind of logical minimalism: there is that which is. Reflection leads to the recognition that "nothing" or "nothingness" are just as paradoxical as anything else, and don't help much except in a rough and ready workaday sense. What seems to count is that there is difference - that which exists yet is different from that which is not the same. It sounds completely asinine yet it has to be. Which is what makes me think of "existences". They exist but are different. I think this strongly implies boundaries and that the world we recognise is actually the evolution of the boundaries where existences meet but do not merge. I am not a Platonist like the mathematical ontologists who believe that numbers are the ultimate reality. You are primarily made up of nothing, or at least the spaces between the baryons and leptons that interact to create you. Dark Energy occurs everywhere, cursory examination appears to reveal that Dark energy is the functional balance to gravity within false vaccuum. Yes, our bodies are crammed packed full of dark energy. What I was attempting to say is that there are no voids because if there was one it would instantaneously and automatically be filled with DE. You are a sharp person Skeptic Heretic and have a better way with words when stating your case, though you can be a little too MACHO or RAMBO at times. I don't understand. Are you trying to say that you don't believe in mathematics? You're welcome to call me on it when I make such a mistake. If you're correct when doing so I'll always provide credit based on relevant observation. Backhanded praise will alway receive vitriol however. I suspect the number you provided is the ratio of the bohr radius to the radius of a neutron, but the proton-electron system produced in neutron decay is not bound (so no volume expansion factor is definable solely via the decay of a neutron). However, to be clear, neutron decay is not caused by the expansion of space-time. Nor does significant expansion of space-time occur during neutron decay. The volume expands by a factor of ~1,000,000,000,000,000 in neutron decay. However, to be clear, neutron decay is not caused by the expansion of space-time. Nor does significant expansion of space-time occur during neutron decay. I am an experimentalist, not a theoretician. 1. The volume of the hydrogen atom is ~ 1,000,000,000,000,000 times greater than the volume of the neutron. 2. The density of the neutron is ~ 1,000,000,000,000,000 times greater than the density of the hydrogen atom. 3. I know absolutely nothing about the expansion of space-time. You do not know what DE is made of, otherwise you would not say what you did. I do know what DE consist of, but that will be revealed later. At least I can say you are not a WIMP. We should start with theory first and then worry about relevant observation later. I did not claim that you said that neutron decay lead to space-time expansion. The last two sentances of my previous post were merely a clarification I thought worth adding so no one would be confused into thinking that that was what your post meant (since I was slightly confused by it as it claimed to offer an "Alternative to Dark Energy" and that was the only part that referred to volume increase of any sort). The "o" in "Ho" is supposed to be a subscript 0 according to the HubbleSite NewsCenter. H_0 is the symbol for the hubble "constant" to which the above article refers. Though I suppose as written the team name garners more attention. When the electromagnetic force fields interact in the light, there is an induction which costs energy and the only way light can get the energy to induktioen from is from its own, why the lights go down into a lower energy level and thus becomes redshifted. Redshift is therefore not by means of motion, so that neither exists a dark energy. There is therefore not an expansion of the universe. When did science people the courage to recognize this? I do know what DE consist of, but that will be revealed later. Really? Shut up. We don't care. To clarify, on small scales do the other four forces "counteract" DE? I have always struggled with this since I would think an experimental result in static space would have observational differences even at small scales with one in an expanding space. We just need somebody clever enough to design the experiment. This article IS about spacetime expansion and Dark Energy. That IS clear and YOU posted here. You claim your theory explains all, then you proceed to tell us you don't know what you are talking about? Just stop. I spoke too soon on the cranks I guess. frajo, your point is still valid though. If you do not care about DE, then why are you here on this site talking about it? Perhaps you should have created the username "Pile" short for pile of s***. DE is such a miniscule force that it is overwhelmed by the action of the other fundamental forces over every scale except the largest scales. There is one way to see it in action on the very small scales you're thinking of. Ever heard of the Casimir effect? @SH: Ouch! Nailed again. Looks like someone just published something this month regarding this in the International Journal of Modern Physics. Since Casimir effect works both as an attractive and repulsive agent I didn't link it. After digging a bit I see that somebody else did. I expect to see that article here on physorg soon. Looks like someone just published something this month regarding this in the International Journal of Modern Physics. Since Casimir effect works both as an attractive and repulsive agent I didn't link it. After digging a bit I see that somebody else did. I expect to see that article here on physorg soon. The Casimir effect, as far as I'm aware, is an artifact due to the interaction of virtual particles upon baryonic and leptonic matter. Dark Energy in most frameworks is also an artifact force of virtual particles upon spacetime itself. Or confirmation of neutron repulsion ? Again, not relevant to the DE or expansion discussion insofar as I can tell. There is one way to see it in action on the very small scales you're thinking of. Ever heard of the Casimir effect? The link between DE & CE is not clear as yet, but I suspect they are not related. The CE arises when the degrees of freedom of a field are restricted by geometry, such as two closely spaced plates. The pressure between the plates is negative, which is also a key property of DE. However, reasons for doubt include the following. Casimir energy sometimes exhibits positive pressure, depending on the geometry of the boundaries (unlike DE). Related, Casimir energy depends on the physical (plate) boundaries, whereas the universe has no physical edges (as far as we can see). The Casimir force degrades quickly with distance, while DE increases with distance. Also, DE is most likely a scalar field, while Casimir energy is a property of the EM field, which is vector. Don't forget, we once considered electricity and magnetism to be completely seperate forces when in reality they are complementary aspects of a singular force. Yes, of course. That is why I expressed my opinion as a doubt, rather than an absolute rejection of the idea. I do look forward to further research into the nature of the vacuum. Thank God the void theory has been debunked. Wrong on both assumptions. Nothing to do with God and this article presents some evidence that the void theory may be invalid, however just because the authors say its ruled out does not make it so. Subir Sarkar of the University of Oxford, a proponent of the void theory who was not involved in Riess's study, says the results are not a fatal blow. "The observers have done a good job, but it should be kept in mind that there is some flexibility in the alternative models, which can in fact accommodate higher values" for the local expansion, he says. He points to a study published in November in the Journal of Cosmology and Astroparticle Physics, which tested a variety of void models against astronomical data. Some of them allow local expansion rates as high as the new Hubble value by positing a "void within a void", where the density of matter is not constant within the void itself, but drops off steeply towards its centre. Although such a model might seem contrived, the alternative is to invoke dark energy, whose origin is very hard to explain, says Sarkar. Prof Subir Sarkar, Rudolf Peierls Centre for Theoretical Physics. Oxford. There is far more experimental evidence of the Casimir effect and neutron repulsion, in my opinion, than there is of Dark Energy. Were these effects considered and ruled out before proposing Dark Energy? I'm sure they were (see my previous post for some objections). On the whole, physicists would rather not have to resort to a new, mysterious and unforeseen force to explain observations if existing theory can do the job. What "new, mysterious and unforeseen force" is greater than Dark Energy? omatumr: Do neutron repulsion or CE explain the apparent expansion of the universe we observe via the Hubble constant / redshift? In my mind DE is only barely less explainable than gravity. The Higgs field predicted W's and Z's for EM - W unification, but gravity is still not tied in by experiment. DamienS: CE and DE are theorized by several to be linked. There are multiple papers discussing brane theory with "folded" dimensions being tied to CE and DE. Also, the paper published this month, Setare & Sheykhi arXiv:1103.1067v1, demonstrates that CE is consistent with the second law of thermodynamics in a universe with DE and DM. My understanding is that the mechanism that produced CE in confined spaces is theorized to be similar to the DE mechanism. I'd guess CE is richer with attractiveness and repulsiveness given the scale, whereas in large scales of DE the repulsiveness apparently dominates. Blind conjecture based on math I've read and don't fully understand. bluehigh: A huge criticism of void models is their requirement that we are in the center. Most astrophysicists are very reluctant to accept our position in the universe as privileged. Void in void seems very much the Ptolemic epicycle approach to me. omatumr: In my mind DE is only barely less explainable than gravity. The Higgs field predicted W's and Z's for EM - W unification, but gravity is still not tied in by experiment. It matters not that in your mind "DE is only barely less explainable than gravity." Neutron Repulsion (NR) has been experimentally verified. The Casimir Effect (CE) has been experimentally verified. Dark Energy (DE) has not been experimentally verified. Were NR and CE ruled out before proposing DE? I wonder if MOND and MOG are actually related to the neutron repulsion you keep on talking about? Come again? Respectfully, you seem to miss the point. How does NR or CE explain the apparent accelerating expansion of the universe / redshift that we observe? CE is only experimentally observable on the very smallest scales. Because of its nature, both repulsive and attractive depending on the experiment, it isn't even in the running as the agent of expansion of space/time. Your first post on this article starts with "Alternative to Dark Energy". I haven't seen you support this, or even provide an inkling to how NR would do this. Back when I was reading the links you post, I confess to giving up on them long ago, I don't remember anything linking NR to space time expansion either. If real, what causes Dark Energy isn't known. Just as what exactly is causing gravity isn't known. It is theorized that gravity is caused by the Higgs boson and the Higgs field, but it hasn't been experimentally confirmed yet (LHC et al). For DE its speculated that it might be branes interacting or dimensional folding or annihilation of virtual particles etc. In gravity's case the W and Z bosons provide some confirmation of the Higgs field theory, while in DE's case CE might provide some confirmation of DEs mechanism. Due to the scales on which DE seems to operate it might be a very long time before we are able to create an experiment to directly confirm any proposed mechanism. TM: MOG theorizes a phion particle that creates a fifth force that counteracts gravity. I believe the scale it works on would be larger, like gravity, than the scales for Dr. Manuel's NR theory. I would think the same would be true for MOND(scale, not the phion). Modified gravity theories work on galactic scales and smaller where lots of neutron repulsion may exist. I cannot find the word phion anywhere. The Z2 boson may be the best choice for the fifth force for MOG. Einstein gravity works on universal scales. omatumr: In my understanding, your theory of NR predicts behavior on the scale of and in opposition to the strong force yet at scales smaller than, but forces stronger than, EM. Am I mistaken? TM: With these scales in mind, assuming my understanding above is correct, gravity on universal scales isn't really the relevant point. The relevant point is the scale at which the force becomes "dominant". Again to my understanding, Per Dr. Manuel's theory, Neutron repulsion provides an energy source, like the strong force and nuclear fusion, that would fuel the sun. So its "dominance" would be in the atomic nucleus and would not be relevant to scales as large as even a golf ball, let alone galactic scales. That NR could provide a large portion of the sun's energy, much as the strong force does in the standard stellar models, isn't the disputed part of his theory. The part most disputed, I believe, is his solar composition and development theory. Thanks for doing the research on "neutron repulsion." Omatumr was the first insistent person to mention the subject and thought he may have been onto something that could be used in galactic scales, because I know it will not work on universal scales like DE. I wonder what happen to Omatumr on this tread? a.) Neutron emission from the core. b.) Neutron decay to Hydrogen. The volume of the individual particles themselves only increase by about a factor of ~1,000,000,000,000,000. The "distance between interstellar atoms is roughly 100 million times larger than the atoms themselves" [Astronomy: the Evolving Universe by Michael ZeilikSee page 306, Section 14.2 The Interstellar Medium: Gas]. Even in 77 when you first proposed this you were laughed at as a steady stater. When will you finally accept reality? And if you're going to continue to refuse reality, show us the math for the decay of bound neutrons in stable nuclei. Even in 77 when you first proposed this you were laughed at as a steady stater. Neutron repulsion had not been recognized in 1977, nor the high abundance of iron (Fe) in the interior of the Sun. 1. "Elemental and isotopic inhomogeneities in noble gases: The case for local synthesis of the chemical elements", Trans. Missouri Acad. Sci. 9, 104 122 (1975). 2. "Strange xenon, extinct superheavy elements and the solar neutrino puzzle", Science 195, 208-209 (1977). Everything non-understandable is a black or dark for the mainstream scientists. Before the Andromeda and Milky Way collision in the cyclic and infinite universe the centre of the Milky Way repeats a Hydrogen model. The recycled matter of the Andromeda and Milky Way will produce two precursor stars of the new embryonic spiral galaxies. Of course space is an amazing cyclic and infinite medium. It has no alternative. We can receive the red-shifted Suns spectrum. Thus BBT is an impressive falsification. Quite a few comments on this and I skimmed through a lot of them, so don't yell too loud if I repeat something brought up earlier. As I understand it, one possible explanation for the weakness of gravitational force is that it "leaks" out of our universe into other dimensions. Question: Could dark energy be gravity leaking into our universe from other universes, creating distributed pulling forces that don't correspond to what we recognize as centers of mass that we can detect? Question: Could dark energy be gravity leaking . . ., creating distributed pulling forces that don't correspond to what we recognize as centers of mass that we can detect? Dynamic competition between the attractive force of gravity and repulsive forces between neutrons sustains life, the Sun, and the cosmos itself as ever-changing "living" systems. a.) Gravity produces a gravitational barrier to the escape of neutrons from neutron stars. b.) Neutron repulsion energizes neutrons, that "bounce around" inside the gravitational barrier. c.) On each encounter there is a finite probability that the excited neutron will leak through the gravitational barrier, neutron-emission. d.) The volume of individual fundamental particles increases by a factor of 10^15 in neutron decay. e.) The separation increases by a factor of 10^10 when hydrogen moves to the interstellar medium. The net volume increase is 10^25 ! On each encounter there is a finite probability that the excited neutron will leak through the gravitational barrier, neutron-emission. In order to tunnel out of a bound state there must be a region with a lower potential than the energy of the state, this is not possible with an inverse-square force alone. Is there a potential due to whatever causes neutron emission? The only reason the Electromagnetic force is weak over large scales is that the average charge of matter is zero. If this were not the case (if all charged matter had the same sign of charge), large conglomerations of matter would never have formed, so no atoms much less planets, black holes, or galaxies. Question: Could dark energy be gravity leaking into our universe from other universes, creating distributed pulling forces that don't correspond to what we recognize as centers of mass that we can detect? e.) The separation increases by a factor of 10^8 (100 million*) when hydrogen moves to the interstellar medium. The net volume increase is 10^23 ! *The "distance between interstellar atoms is roughly 100 million times larger than the atoms themselves" [Astronomy: the Evolving Universe by Michael Zeilik, See page 306, Section 14.2 The Interstellar Medium: Gas]. I think too many people accept what they are told way too easily Gravity is not weak, it has the force to hold planets and stars in orbit and the capability to collapse space time itself as in black holes , then tell me how that is one weak force?? Here's a simple experiment to try at home. Get a piece of paper, hold it against your fridge and then place a fridge magnet on to it - let go. The puny little fridge magnet stays affixed to the fridge easily overcoming the force of gravity generated by the whole planet! Even your muscles can withstand the force of the entire planet, allowing you to move, run and jump around all day long. That's how weak gravity is. @soulman although we experience relatively weak gravity on Earth due to it being relatively low density compared to some other objects within the cosmos, don't forget Gravity has the potential to crush the entire Earth to the size of that fridge magnet. Correct me if i'm wrong but if a hypothetical molecule was positioned exactly at the edge of a black holes event horizon, wouldn't the gravity field strength be enough to wrench subatomic particles from it, i.e. overcoming other forces? Its not gravity that is a weak force but the majority of the universe's artifacts exhibit low levels of gravity due to their structure, a black hole that could be created at the LHC would be very tiny but still have the same gravitational field strength at the event horizon as one of its bigger cousins. Oh whoopy do, youve identified it to with in 3.3%, but is it slowing? is it accelerating...These are the real questions. I couldnt care less about what theories are dispensed with until, we know for sure the exact amount and whether its continuing to expand or decreasing in its rate of expansion its pointless speculating. Our senses allow each one of us to have only one universe. Agreeement between two observations does not make two universes identical. omatumr: Does neutron repulsion . . . explain the apparent expansion of the universe we observe via the Hubble constant / redshift? Neutron repulsion appears to explain the expansion of the universe and the accelerating expansion rate observed with the Hubble telescope - without fudge factors. Dynamic competition between attractive forces of gravity and repulsive forces between neutrons powers the Sun and the cosmos [http://arxiv.org/...2.1499v1]. Nuclear evolution is NOT in the direction of fusion (as imagined in standard cosmology models), but in the reverse direction of fragmentation and dissociation. The universe expands because the volume of individual particles increases by a factor of ~10^23 when neutrons from compact neutron cores become interstellar hydrogen in the process that sustains life, the Sun and the dynamic cosmos. @Omatumr observations suggest the rate of volume increase of the universe is accelerating, suggesting the theory would require increasing amounts of Neutron releasing matter, but the rate of Neutron release should be decreasing considering the ingress of matter to Black holes, leaving less available Neutron releasing matter and therefore a decreasing rate of expansion. 2.) Fragmentation of galactic centers to produce cores of stars. Neutron emission is like water evaporation. It ONLY occurs from the surface. When massive neutron stars at the cores of galaxies fragment into smaller neutron stars at the cores of stars, the surface area of neutron stars increases. Like a sprinkler squirts water into droplets and increases evaporation. That is why the rate of acceleration increased. The acceleration of the expansion of the universe is an effect that increases the rate of increase in distance between any two (not gravitationally bound to each other) objects as time passes. Since I would expect neutrons (or fragments) to be emitted isotropically; I don't see how neutron emission can lead to an increase in distance between the centers of mass of the two galaxies (much less an increasing rate of distance increase). Fragmentation of galactic centers to produce cores of stars. What stops the cores of stars from fragmenting further (if something the mass of a star can "fragment" off why can't the fragment then break in half, then fourths and so on)? The cosmos is powered by dynamic competition between gravitational forces of attraction and neutron forces of repulsion. Just as opposing forces cause a nucleus of uranium to be alive. It may emit an alpha particle, it may fission, it may do neither. If only one force totally controlled, there would be no dynamic changes in you, or me, in the Sun, or in the cosmos. That is why the universe is "alive." You will not find the answer in simplistic "either/or" thinking.